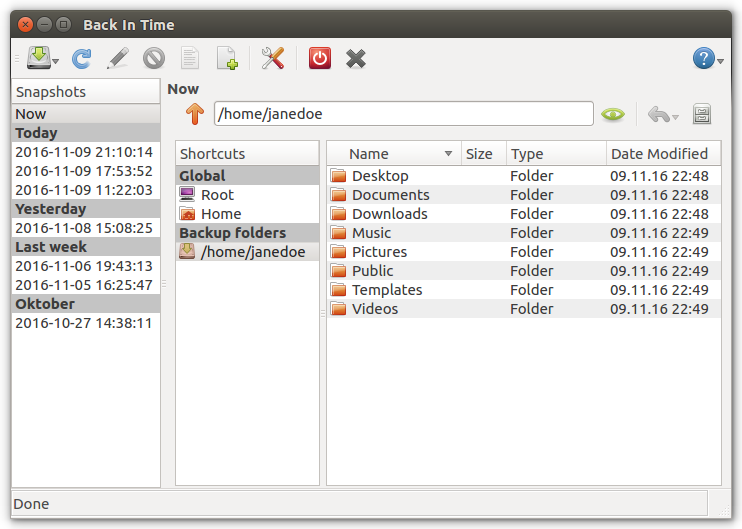 Back In Time is a simple backup solution for Linux Desktops. It is based on rsync and uses hard-links to reduce space used for unchanged files. It comes with a Qt5 GUI which will run on both Gnome and KDE based Desktops. Back In Time is written in Python3 and is licensed under GPL2. Backups are stored in plain text. They can be browsed with a normal file-browser or in Terminal which makes it possible to restore files even without Back in Time . Files ownership, group and permissions are stored in a separate compressed plain text file (fileinfo.bz2). If the backup drive does not support permissions Back in Time will restore permissions from fileinfo.bz2. So if you restore files without Back in Time , permissions could get lost. © Copyright 2016, Germar Reitze. Revision 4846faf0.